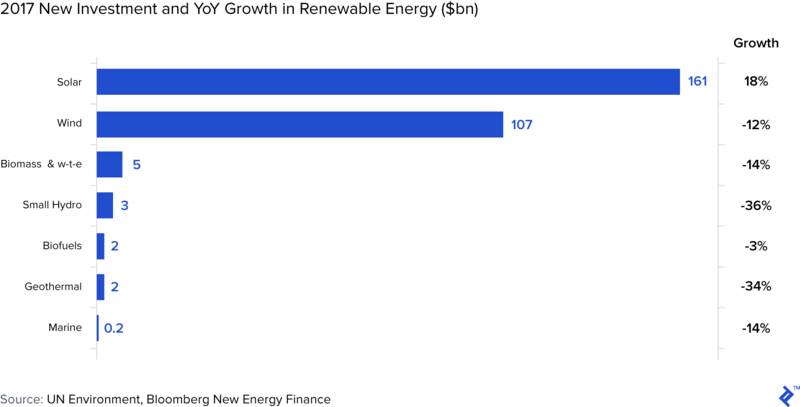 Renewable energy capacity is growing. in 2018, 33% of all installed power plants across the world are now from renewable energy sources. This is projected to grow by 43% up to 2022. Solar and wind power together represent 80% of the capacity growth in the sector. As renewable energy sources, they have proven to be the most feasible for mass-market adoption. China alone is responsible for over 40% of global renewable capacity growth and 45% of total investment. This is largely driven by concerns about air pollution and capacity targets. Falling costs: modules and inverters make up 70% of the cost of a solar installation. In 2018 alone, the cost of modules are expected to fall by 35%. Cheaper project costs are contributing to solar’s levelized cost of electricity (LCOE) falling to levels similar to those of fossil fuel. Tariff changes: a move away from guaranteed government “Feed-in-Tariffs” to more competitive Power Purchase Agreement (PPA) auctions is driving growth. 50% of future renewable expansion is projected to come from such agreements, which result in attractive end-prices to consumers. Cost-cutting is rampant: in order to make falling tariffs profitable, renewable energy producers are having to find ways to cut costs. Measures focused on equipment cost and maintenance can help to improve efficiency, but can severely compromise quality and safety if too many corners are cut. Consumers are benefiting from lower energy tariffs, but in the long-term, it’s inevitable that consolidation will have to occur between energy generators. Economies of scale matter and companies with deeper pockets and better operational integration will prevail in bid tenders. At the start of the value chain, the equipment manufacturers are facing oversupply issues due to China’s recent pivot to withdrawing support for solar photovoltaic generation. While we are entering a golden era for renewable energy, it’s inevitable that with less government subsidy support, the unrealistic expectations between end-price and generation cost will result in market correction. The cost of renewable energy is now falling so fast that it should be a consistently cheaper source of electricity generation than traditional fossil fuels within just a few years. The cost of generating power from onshore wind has fallen by around 23% since 2010, while the cost of solar photovoltaic (PV) electricity has dropped by 73% in that same period. The growth of renewables in the past decade and its projected growth. Reasons behind the sustained fall in costs and hence in tariffs of renewable energy. The impact of falling tariffs on two key stakeholders – power generating companies & equipment manufacturing companies. Note: In this article, we focus on solar photovoltaic (solar PV) and wind-based utility-scale power, as opposed to other growing renewable technologies such as solar home systems (SHSs), battery/storage-based applications, electric vehicles (EVs), heating systems, biofuels, etc. In 2017, global renewable generation capacity increased by 167 gigawatts (GW) and reached almost 2,200 GW worldwide. To put that into perspective, the total global installed capacity from all energy sources is around 6,700 GW – so renewables make up 33% of all installed power plants. Note, however, that this doesn’t mean that 33% of all energy generated is from renewable sources. Total energy generated is a function of a capacity factor (CF/CUF) or plant load factor (PLF) and as a rule is higher for conventional power plants such as coal and gas. I’ll go more into capacity factor and plant load factor later on. During the same period, net additions of coal and gas-based power was 70 GW, about 40% of renewable capacity addition. Solar photovoltaics (PV) grew by a significant 32% in 2017, followed by wind energy, which grew by 10%, while coal power addition declined. The global renewable energy transition continues to move forward at a fast pace because of rapidly falling prices, technological improvements and an increasingly favorable policy environment. As per IEA forecasts, renewables are set to witness strong growth through to 2022, with an installed capacity growth of 43% (i.e. addition of 920 GW). Additionally, wind and solar together will represent more than 80% of global renewable capacity growth over the next five years. 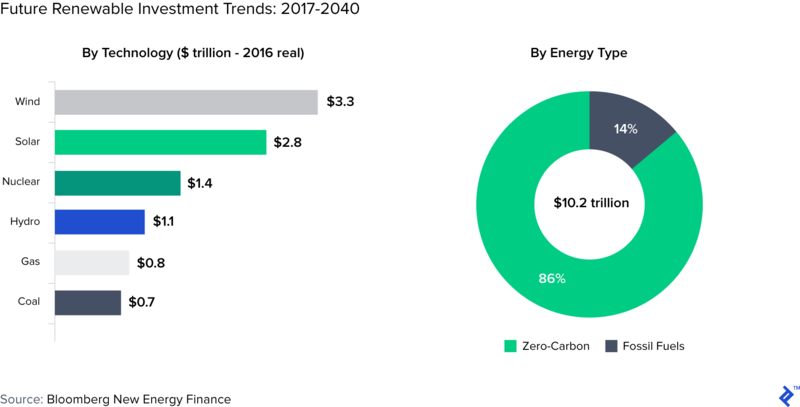 Renewables are forecasted to capture 86% of the $10 trillion that the world plans to invest in new energy capacity up to 2040. China alone is responsible for over 40% of global renewable capacity growth and 45% of total investment, which is largely driven by concerns about air pollution and capacity targets. Complementary to this strategy is the fact that Chinese companies account for around 60% of total annual solar cell manufacturing capacity globally. Market and policy developments in China will have wider global ramifications for solar PV demand, supply, and prices. 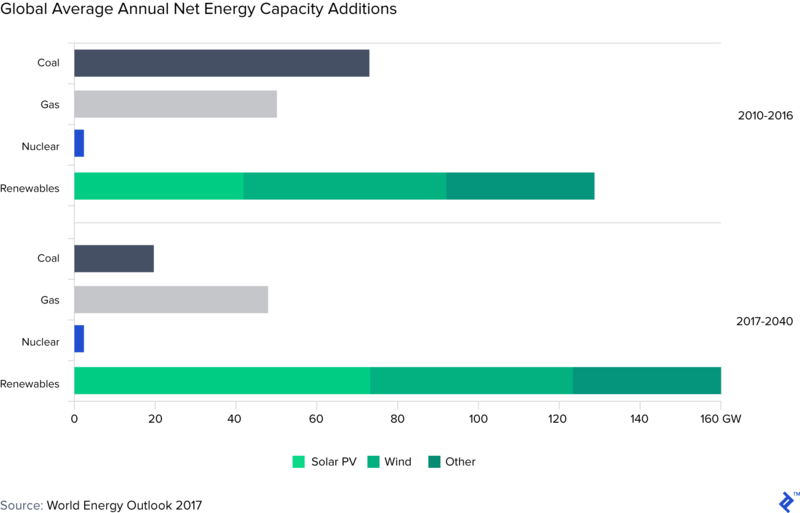 This profound transformation of the power markets means that by 2023 Solar and onshore wind will be economically competitive with new U.S. gas plants, surpassing them by 2028. 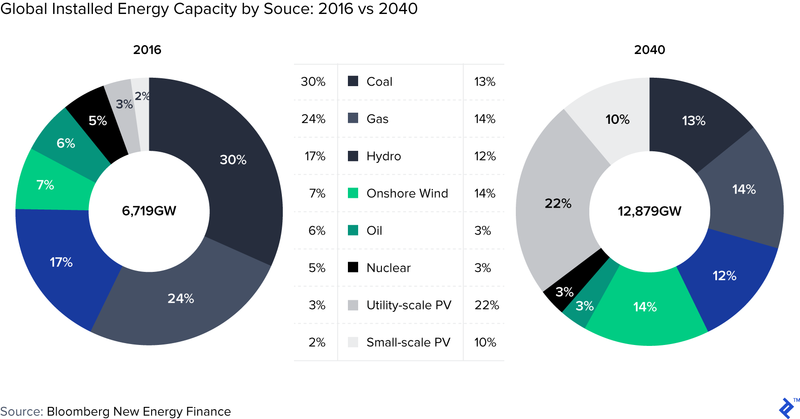 Moving forward, by 2040 solar and wind will make up nearly 50% of installed capacity and over 33% of generation – a 4x jump in wind capacity and a 14x jump in solar. 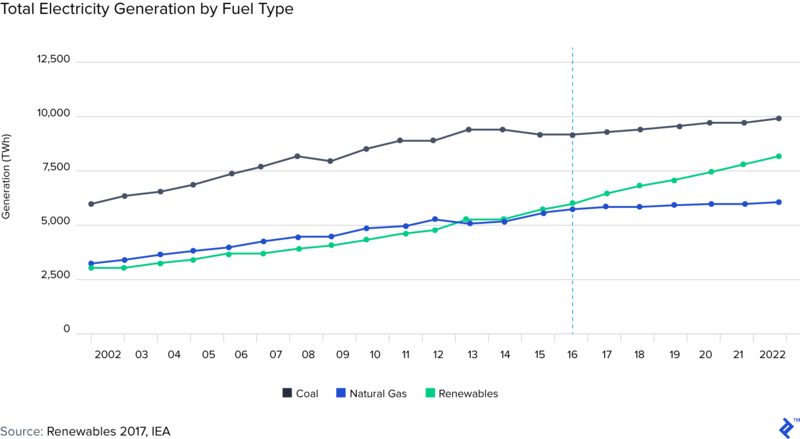 Renewables are now also catching up with the traditional energy workhorse, coal, in terms of energy generation. Here’s a quick way to understand the difference between power (MW) and energy (MWh) – In general, renewables have a lower capacity factor (CF/CUF) or plant load factor (PLF) than conventional power plants, i.e. for every 1 MW of capacity, a renewable plant generates less energy (or MWh) than the corresponding conventional plant. For solar and wind power plants, the PLF typically ranges from 15-30% whereas for coal and gas plants, the PLF can be in the range of 60-90% with PLFs as high as 95% also achievable, i.e. a 1MW renewable plant typically generates 1,750 MWh a year whereas a conventional plant typically generates 7,000 MWh a year – a huge difference. Among renewables, only hydropower can compete with conventional power PLFs, with some hydro plants having PLFs above 70%. Even with low PLFs, the rate of capacity addition has increased to the point where, on a global basis, renewables now generate the same amount of energy as gas plants. They are also forecast to close the gap with coal by 2023 (17% gap), which represents a significant achievement. In my observations, modules and inverters make up around 70% of the cost of a utility-scale solar power project – and these are the two components that have been driving the falling cost of solar power. 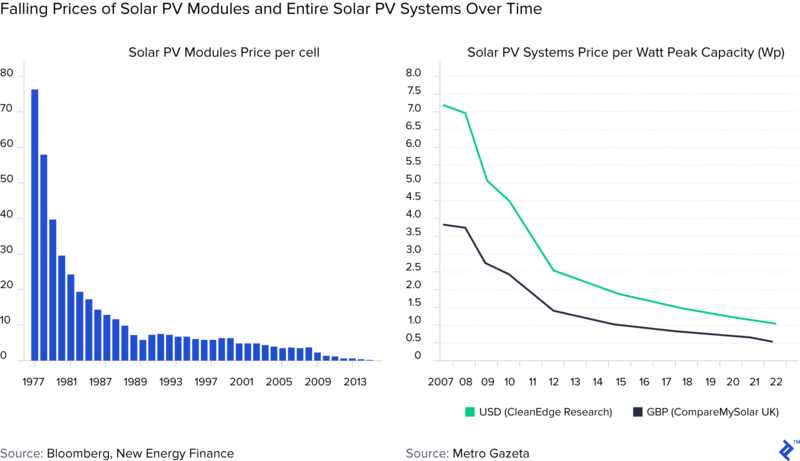 Solar module and inverter prices have declined for a variety of reasons, including but not limited to: oversupply, Euro and Yen depreciation, and the downward adjustment of the minimum import prices. In the solar PV industry, buyers are also extremely price sensitive, which creates persistent price pressure on equipment suppliers. The global average selling price of solar modules is expected to decline by around 35% in 2018, due to the Chinese government curtailing solar growth through new policies initiated in June 2018. Drivers for a fall in the price of wind equipment include falling prices of turbines and inverters, improvements in installation techniques , better supply chain management, and lower cost of capital for manufacturers. 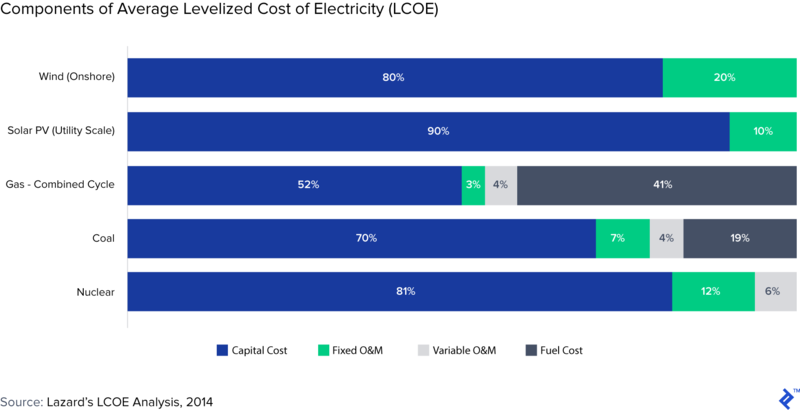 Levelized cost of electricity (LCOE) is an important metric in energy; it measures the all-in cost of generating each MWh of electricity from a power plant (over its entire useful life). This includes the cost of project development, construction, and various operational expenses. What we are seeing in 2018 is that the LCOE of solar PV and wind is now on par with fossil fuels. Onshore wind has the lowest average levelized cost at $45/MWh, and utility-scale photovoltaic plants aren’t far behind at $50/MWh. By comparison, the lowest cost from conventional technologies were gas combined cycle technologies, averaging $60/MWh and coal plants, averaging $102/MWh. 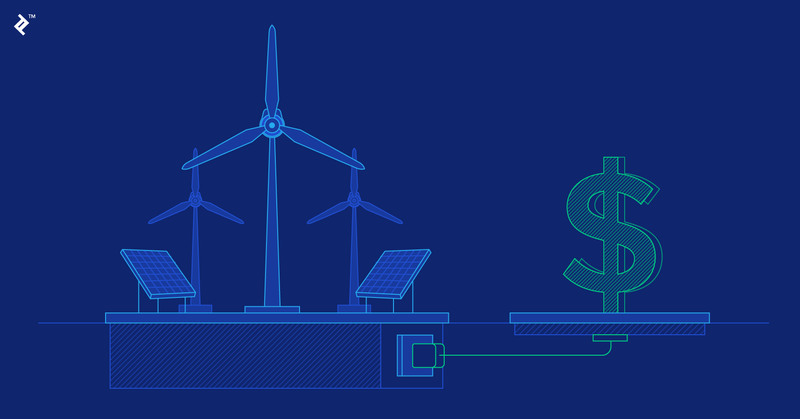 Many renewable technologies, such as wind, solar, and geothermal, are not cheap to build, but they have no fuel costs once they’re up and running, and generally have lower O&M costs too. Hence, a fall in equipment costs of renewable equipment has a much greater impact on its LCOE than a similar drop in equipment costs for conventional generation sources. Fuel, operational and maintenance costs typically rise with inflation over a 20-25 year period, hence they have a disproportionately high impact on LCOE. As a result, announced contract prices for solar PV and wind power purchase agreements are increasingly comparable to, or lower than, the generation cost of newly built gas and coal power plants. You can see below the effect of lower costs for solar in particular, where its LCOE in 2017 is just 14% of what it was in 2009. Why do we Still Require Fossil Fuels? Although wind and solar are now cost-competitive and offer considerable environmental advantages over fossil fuels, they are nevertheless, still considered “intermittent” or “variable” energy sources. The sun doesn’t always shine and the wind doesn’t always blow. As a result, wind and solar are unable to entirely replace the services that certain conventional “baseload’” sources provide to the system. However, utilities and power operators are discovering a multitude of new ways that these technologies can offer more value to the power grid across the board. The next breakthrough in renewable technology will be with cheap, scalable and efficient energy storage using batteries. In a sense, this is the holy grail of renewable energy, to be able to store energy for use when generation is impossible. Lithium-ion battery prices have halved since 2014, and many analysts think prices will fall further as a slew of large battery factories are built. As we have seen with companies such as Elon Musk’s Tesla and SolarCity, innovation and vertical integration within the battery space is progressing rapidly. Renewable power projects have historically relied on government policies to provide them with confidence about the tariff (or Feed-in-Tariff) that they will receive for the electricity generated, to give guidance to project revenues. Policies are now changing direction and many countries are moving from government-set tariffs to competitive auctions with long-term Power Purchase Agreements (PPAs) for utility-scale projects. A PPA is an agreement signed between a purchaser or “offtaker” of power (state-owned or private utility or private corporate) and a power generator to purchase some, or all of the power generated at a predetermined cost or “tariff” over a defined period of time (normally 20-25 years in a renewable context). Almost 50% of renewable capacity expansion over 2017-22 is expected to be driven by competitive PPA auctions, compared to just over 20% in 2016. This competitive price discovery mechanism through tenders has squeezed costs along the entire value chain, thus becoming a more cost-effective policy option for governments. 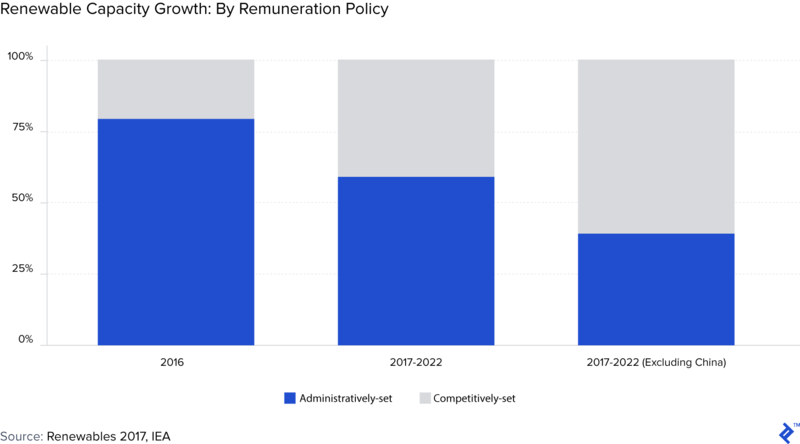 Increased competition has reduced remuneration levels for solar PV and wind projects by 30-40% in just two years in some key countries such as India, Germany, and Turkey. 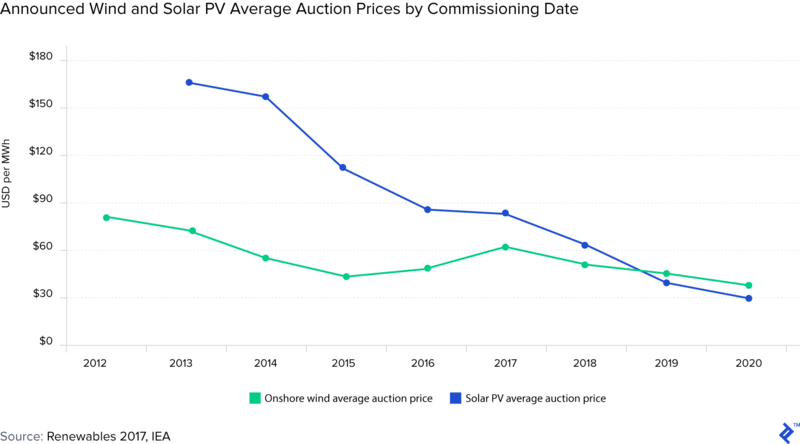 Announced auction prices for wind and solar have continued to fall, although average generation costs of newly-built projects remain higher. Over the period 2017-22, global average generation costs are estimated to further decline by around 25% for utility-scale solar PV and by almost 15% for onshore wind. The lowest tariffs from 2017 auctions came from Mexico – where average solar and wind bids were $20.80/MWh and $18.60/MWh respectively. Both figures are regarded as world record lows. In India, solar auctions are now witnessing tariffs of $30-40/MWh, down from $90-100/MWh just 4 years ago. Unlike other auctions around the world, winning tariffs in India are not inflation-indexed, so their real value rapidly erodes. Good News for Utilities and Customers? Falling energy tariffs mean lower spends for state-owned utilities and governments. If the lower prices are passed on to end consumers (industrial, commercial or residential), they benefit as well. End consumers such as private corporates also benefit if they have directly entered into a PPA with the power generating company. We will now look at the impact of these falling tariffs on other stakeholders in the energy value chain – i.e. power generating companies and equipment manufacturers. Falling tariffs have forced power generating companies to adapt and optimize costs. Lower equipment procurement costs, lower cost of financing, and economies of scale have assumed more importance than the ability to actually implement projects. In developing countries, additional risks that need to be borne by the developer also add to these costs, through local currency depreciation, hedging costs, and uncertainty on import duties and taxes. Every component that goes into the manufacture of the module (i.e. the cell, back sheet, glass, frame, etc.) can be “cost-optimized”, but whether these sub-par modules will generate rated power for 20-25 years remains to be seen. In a module, cells are where the conversion from sunlight energy to electrical energy happens. They can reach temperatures of around 80 degrees Celsius in certain conditions, thus lower quality cells can severely impact generation in the long term. Their role is to convert the direct current (DC) produced by the modules into alternating current (AC) that can be fed into the grid; circuitry that forms the heart of the solar PV system. Most inverters in use today have a life of 10-15 years and need to be replaced at least once during the tenor of the average PPA (i.e. 25 years). But with falling tariffs and low O&M budgets, the inverter is a common cost-cutting casualty. Steel structures, also known as module mounting structures, have the job of holding up the modules for a period of 20-25 years in all weather conditions. The latest trend is to reduce the amount of steel used in the mounting structures both in terms of tonnes per MW (less than 25 MT per MW) and thickness (less than 1mm). Steel is a relatively costly component tied to inflation and hence can severely impact construction budgets. All of these cost-cutting measures will affect the overall production (PLF or CUF) of plants, which leads to a higher LCOE (which is calculated per kWh generated). Starting a vicious cycle for generating companies, since tariffs are fixed and hence realizations are lower. Developing renewable energy assets is now only for the large players with deep pockets. I have had the opportunity to submit bids for multiple solar and wind project clients, big and small – and in all cases, the smaller size (less than 5MW) bids were not as competitive as larger project sizes (above 50MW). While this is a natural benefit that larger projects enjoy, in many instances, setting up a 50MW solar power project (that’s roughly 200-250 acres of contiguous land required) might not be feasible either due to unavailability or unaffordability of the land Note: Every MW of solar needs 4-5 acres of land, which can increase based on land shape, terrain and other site conditions. The need for distributed generation, rather than large-scale plants, is a pressing and age-old one, but low tariffs will only hasten the demise of smaller generation units. The prevailing low bid tariffs have set an unrealistic expectation in the minds of “offtakers” (purchasers) about the true cost of renewable energy. Offtakers, either state-owned or private, are unwilling to pay much higher than the minimum quoted bid for any renewable power – irrespective of the size of the power plant. This again leads to a vicious cycle of cost-cutting, sub-optimal performance, higher LCOE and higher loss per kWh for the generator. This has led to consolidation in the solar generating industry, with only a handful of players bagging all major PPA contracts announced by state and central utilities. Smaller players have had to pivot their business model and focus more on the EPC (Engineering, Procurement & Construction) model for quick cash flows, but here margins are wafer thin due to the prevailing tariffs. Even among the larger companies, there have been liquidations and layoffs due to the deteriorating unit economics. Find new customers to absorb the excess production. Sell the product at a significant discount and reduce capacity to serve the current level of demand. This normally leads to layoffs in manufacturing plants both in China and overseas, due to Chinese products flooding overseas markets at historically low prices. While the cost of renewable energy has fallen, the publicized auction tariffs do not reflect the true cost of generating that energy. The positive difference between the cost and the revenue received by the generator has an adverse impact on the value chain. As mentioned here, unit economics always matter (even in renewable energy) and companies must ignore this at their own peril. The fall in prices should not be celebrated as an example of progress. Falls in prices need to be sustainable and inclusive, to be indicative of a progressive renewable energy regime. What is solar and wind power? Solar power is the conversion of energy from the sun into electricity, either directly using photovoltaics (PV) or indirectly using concentrated power. Wind power harnesses energy from natural wind flow to power turbines to generate electricity. What percent of US energy is renewable? in 2016, 12.2% of US energy was provided by renewable sources.